cement, the Desert Museum looks at first as if it were individual clubhouses, built by industrious street urchins from a Hal Roach movie, but upon closer inspection you can see the sly and whimsical political and social commentary. A four-page brochure at the edge of the property encourages the visitor to browse the grounds and informs of the artists’ motives, and muses. Not far away is a “room” which gives the impression of a post-apocalypse work office complete with electrical wires, cubicles and keyboards strewn about. One building looks like a fortress, intimidating, and dangerous, and yet many of the pieces give off the feel of a playground or a carnival, like Carousel. Carousel is a brightly painted circular structure that was created for a seven year old girl and “one of my favorite artists in the community” Noah was quoted as saying. 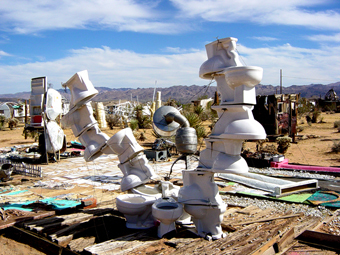 Noah Purifoy was the founding member of the Watts Tower Art Center, where he taught art during the Watts Riots of 1965. An educated man, he held three separate degrees. One in social science, one in social service, and the third in art form. 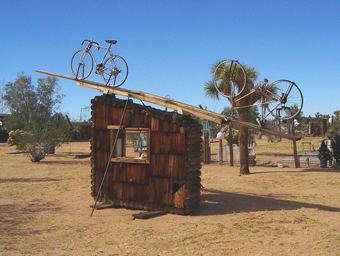 Quite an accomplishment in any right, but especially impressive when considered that Noah Purifoy (a black man) was born in 1917 Alabama. On the way out of the museum stands a drinking fountain with a sign above, which reads, “White.” Three feet to it’s left there is a yellowed toilet bowl. It’s sign reads “Colored.” It is said that Noah encouraged his audience to “see the world as it truly is, not with anger but with understanding,” It’s a fair commentary.